Pre WW1 the Isle of Man hosted, besides the thousands of holidaymakers from North West England, camps for the Territorial Army - the largest of these was at Knockaloe Moar, a large farm just outside Peel - when in 1914 the British Government determined that the first internment camp utilising Cunningham's Holiday Camp would be insufficient for the number of internees, Knockaloe with its convenient access to Peel and an adequate water supply was the obvious choice. The above figure shows part of the farm in 1868 - the parish church had been built in 1714 on land donated by the farm but by the 1870s was in a very poor state of repair and a new church was built in 1881 just to the south of the Parochial School and the old church demolished and used a part of the grave yard - the graves of 6 Turkish and 2 Jewish Knockaloe internees were just outside the NE corner of the old yard. The Bishop wished to build the new church 2 miles south of the old church at Glenmaye which had greatly developed because of lead mining in the area and there were very few living near Knockaloe - all of the housing seen today dates well after WW1. ... A tour of the Island was made, with the result that the only site which presented itself as suitable for the purposes of a camp was one in the vicinity of Peel, on a farm known as Knockaloe Moar. This site had previously been used as a camping ground for Territorial troops. It possessed an adequate water supply, owing to the water-main supplying the town of Peel passing the site. The soil, however, was found to be of heavy clay, but it was thought that, with abundance of cinders available, it would be possible to maintain satisfactory paths, and, by raising the huts some inches from the ground, the objections of the clay soil would be overcome. Dr. Bond approved the site, and later, the Government Office was requested to proceed with a Camp for the accommodation of about 5,000 prisoners of war. Plans were prepared, and a contract was given to Mr. Mark Carine, a Douglas builder, for the erection of the huts, there, fortunately, being a considerable supply of timber in the Island at the time. This would later be known as Camp I - the locally built huts differed in some respects from the later arrangement of two long huts back-to-back, being a single hut. Though the difficulty with the terrain as being heavy impervious clay had been noted the use of cinders proved to be a poor solution and many thousand railway sleepers would be eventually be needed to provide adequate roads. Local newspaper reports suggested Carine was paid £6000 for the work. Captain F. W. Smith Cleburne, a professional engineer, who came to Knockaloe as a regimental officer with a company of National Reserves, was later seconded for the purpose of taking up the position of Camp Engineer. He was responsible for the electric lighting of the entire Camp, and for the Sewage Pumping Station, for the introduction and installation of both of which systems he was largely responsible. 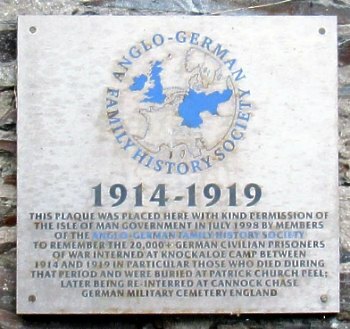 The first troops (7th + 9th Company 2/5 Kings Liverpool Regiment) arrived in Douglas on the 13th November and took up occupation of the then very scant quarters at Knockaloe on Saturday with the first batch arriving on Tuesday 17th Nov 1914 for Camp1, by the following monday some 1334 internees had arrived, another 358 arrived on 23rd Nov, a further 400 in the week from 5th Jan 1915, another 150 three weeks later, another 607 on 3rd March, another 400 on 13th March and another 1050 on the 23rd + 24th March giving just under 4000 in the camp (the small number of internees moved to Douglas etc have been ignored). A further 1008 arrived 8th April taking Camp 1 to just over 5000, it remained close to its designed capacity for the rest of the war and afterwards with the first significant decline in January 1919 but still remained well over 1500 until October 1919 when it was the last camp to close. There would be three more camps - Camp II occupied the three fields to the west of Camp I , Camp III the field to the south of the farm road and Camp IV in a field south of Camp III. Camp II opened in late June 1915 and was the first to close in early February 1919; Camp III opened in early July 1915 and had closed by 1st Apr 1919; Camp IV opened in mid September 1915 closed a few days after Camp III - in all of these camps the internees arrived at an average rate of well over 100 per day. Within a year of taking the first internees there were some 22000 held within the camp. The short peak of 600 internees arriving in early July 1916 were from Alexandra Palace which would appear to have the role of a clearing house and probably were those displaced by the closure of Stobs to civilian internees. The largest number of internees was 22769 recorded on the 14th July 1916. Unlike Douglas Camp the register book for Knockaloe does not appear to have survived - the figures on internee numbers are derived from the daily register of internee numbers held as part of Manx Museum MS 09310 (5 boxes labelled "Isle of Man Constabulary archives") which is a specially printed book dating from 14 September 1915 into which earlier records were transcribed. It would appear from a note in the Camp Letter book noting a letter sent to the Goverment Secretary dated 24th April 1915 that internees numbers were in error by 6 from 24 March onwards for though transfers were marked off in Orders and Register books they were omitted from the small book kept for nunbers. Each leaf of this new book covers a week running Sunday to Saturday with each day split between the 4 camps with major columns headed "Total present at 9am yesterday", "Since admitted", "Since released" and "Total present at 9am today" together with a count of those in hospital and a space for remarks. Each column is split into subcolumns headed G(for German), A(Austrian),T(Turkish - later subdivided into T + B(Bulgarian) and O for other (this being required by War Office letter 0103/3355 from 1st May 1915 onwards). The Isolation hospital is included under camp III where the number of the camp and isolation hospitals are indicated as e.g. 20/100. The hospital numbers are included in the graph shown above - typically about 1% of each camp would be in the camp hospital and about 0.5% of the total in the Isolation hospital though numbers fluctuated quite considerably. One note found throughout this book was the monthly return of the average daily number of internees. There is a note as to number of deaths in the camp as 31 in 1915, 46 in 1916, 30 in 1917, 55 in 1918(the year of 'Spanish flu') and 13 to the closure of the camp in 1919 (a total of 175 though the Patrick burial book has 224 + a further 27 thought to be RDC) though some still remained in the Lunatic Asylum and Noble's hospital post this date. These numbers compare very favourably with those for the Manx residents e.g. in 1911 there were some 82 deaths of males aged between 16 and 45 from an estimated population of around 11,000 such males. There were other deaths in Noble's Hospital of the more seriously ill internees transferred there - these were buried in Douglas Borough Cemetery. The Douglas Camp allocated each internee a number on arrival, if that internee left the control of the camp e.g. to be jailed in Douglas or Liverpool prisons or to spend time in Noble's Hospital then a new internee number would be allocated on return to the camp - the same scheme applied to Knockaloe, e.g. a Hans Herzog was allocated 23644 on his arrival from Islington sometime in 1916 but was briefly transferred to Alexandra Palace so he could be involved in some legal action and was given 28213 on his return some months later. However the lack of an admissions register means that a full list of internees with arrival and departure dates will be difficult if not impossible to construct. The Camp Order book covering the final year of the camp (also found in the MS0930 trove) notes the allocation of internee number 34936 to the final list of post-Armistice transfers into the camp in September 1919. As Sargeaunt notes "the Compound system at Knockaloe Camp was similar to what was adopted in Normans Cross Camp. 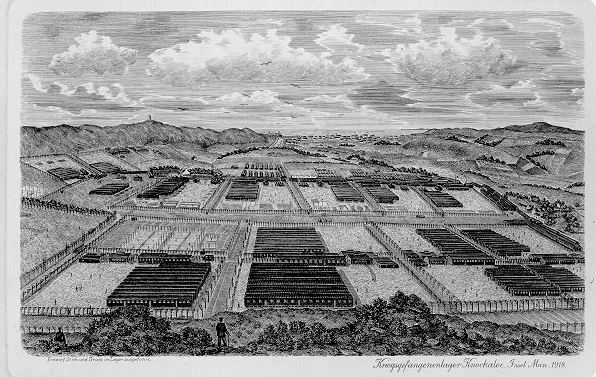 By dividing the Camp into self-contained Compounds of 1,000 prisoners each, not only was the maintenance of discipline rendered easier, but the distribution of stores was greatly facilitated. The scheme had the further advantage of reducing sentries", By the time Knockaloe Camp was completed there would be 23 such compounds. There were also compounds for the Military Guards and for the civilian workers (or Blue coats from their distinctive uniform) together with numerous storage and service buildings including the centralised bakery. In April 1916 there were 1803 troops watching over 20732 Aliens. The camp at Knockaloe at present leaves much to be desired, the defects arising from overcrowding and failure to complete certain works necessary for the comfort both of inmates and guard. The Committee strongly regret that the Insular authorities when they found that they were not able to carry out their undertaking to have the camp ready by 11 November for the reception of 5,000 aliens, did not immediately report this to the Committee for the information of the War Office, as much inconvenience and dissatisfaction would have been prevented. At the present moment some 1,334 prisoners are interned there, and are much overcrowded, some of the huts contain double the number of men which could properly be accommodated there permanently. The Committee gave directions that the reception of aliens should be suspended until further orders. and they have impressed upon the Isle of Man authorities the urgent need of hastening and supervising the work which is being carried out by the contractor and of carrying out the suggestions now made. In fairness to the authorities it is only right to point out that the weather on the Island has been so exceptionally wet and stormy as to make work practically impossible. The Huts are sectional, being of the regular War Office patters, 30 ft. by 15ft., each section holding 30 men. Six huts are placed together and each hut is capable of accommodating 180 men. They are provided with trestle-tables and chairs for each group of ten men, and each man had a bed board, mattress and 3 blankets. Two lengths of 3 patters were placed almost back-to-back sharing a common central gutter. The huts are being put in good weather proof condition and are being protected against the wind and rain by felt and tarred paper. We were told that arrangements were also being made to provide the huts with porches, so that the doors might be sheltered. The new Commandant, who has only been there some ten weeks, seems to have the confidence and respect of the interned men. He seems to be doing all in his power to better the conditions of the camp. He finds difficulty in getting material, such as tarred paper or felt, etc., for use on the huts. He told us that he had the matter in hand and was giving the betterment of conditions of the camp every attention. Each group of 6 huts was separated from its neighbouring hut-group by a gap (from photos maybe 2yards) - in several photographs washing lines were suspended between adjacent huts to allow washing to dry.. Refuse is now thrown into the sea from a high cliff at a short distance from the camp, where it is rapidly carried away by the tide, and the garbage is carted far away into the country and used for purposes of manure. We were informed that attention is being given to the drainage and water question. Presumeably it is the waste from the septic tanks that would be used as manure. The tipped rubish was briefly described by Cowley. Camp I was as stated designed for 5000 men split between 5 compounds - the area allocated was split into 6 sections, 5 for the huts and the sixth as a camp hospital section. The five huts in each compound each held 200 men in large huts built to a design by the builder Mark Carine and his workers using sections already on the Island. The messing or dining arrangements in the initial design need to be investigated. I suspect that a similar scheme to Douglas was envisaged with a central dining hall for each compound, however as seen in many actions there was great fear of allowing large groups of internees to gather in a single location - after the Douglas dining hall shooting this fear would seem to have intensified. As Hartmann comments there was no international convention on the provision of entertainment or educational facilities for internees - the Manx weather also pushed the need for suitable indoor facilities - it was possibly the combination of these concerns that led to the provision of a central cookhouse in each compound, governed by an elected kitchen committee, that drew its supplies from the central stores with each hut or part thereof collecting the food from the cookhouse for consumption in the huts. This removed the camp governance from any criticism of the food provided (assuming that the raw materials were of adequate standard) which was a significant factor in provoking the disturbance at Douglas, avoided large scale gatherings that could turn nasty and as a side benefit provided a seperate building that could be used for entertainment etc. [in each compound were ]5 long parallel rows of wooden huts, of which each is divided by a partition wall beneath the roof ridge into 2 narrow, bottle-shaped half-huts, in each of which 100-110 prisoners live. Here they sleep, eat, work, play, chat and smoke. Each half-hut has a door and a window on the 2 gable ends, and on the outer longitudinal wall 3 doors and several windows. 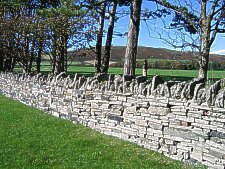 On this outer wall, 2 rows of beds (bunks) are mounted on top of each other, and the middle wall, which is higher, even has 3 rows, with the result that the prisoners lie in their beds as if stowed on shelves. Each bed consists of a flat piece of wood, a paillasse, and 3 cotton blankets. The top bunks, especially the ones on the outer wall, have been equipped by their happy owners partly with tables (over the head or foot of the bed), shelves and curtains, and look like little rooms in which the owners can also live throughout the day by folding back the paillasse and placing a chair in the space which has become free. The lower and middle bunks by contrast are suitable only for use as beds and storage space. Some bunks are always unoccupied and serve the table-societies as crockery cupboards; this is because each prisoner, in addition to the usual knife, fork and spoon, also has a soup-bowl, a vegetable plate, and a teaspoon, all in enamel. In the middle of the room 10 or 11 tables stand in a row, with a matching number of chairs, and between them are 3 little iron stoves, which are heated up in winter. When people are sitting at the tables, no one can easily get past behind them, if the tables and chairs are not pushed up as far as possible close to the beds on the middle wall, so that on the other side a narrow corridor is created. Stored beneath the beds are the prisoners' boxes and suitcases, while, sewn in paper or cloth, and hanging down from the ceiling, are the prisoners' better suits, which they will only take down again when they go home. In some Compounds, as in Camp I Compound 4, the huts are arranged in a more practical and comfortable way. There, instead of 5 large huts, they have 10 small ones, which are as long or longer than the others, but lower and narrower. 2 each of these are built on to each other lengthwise, and the latter is divided up by 2 transverse walls into 3 comfortable living rooms, each for 30-35 men, who have their beds all standing on the floor along the walls, and each at 3 tables. The floor of our hut was always damp. Only the b huts got any sun, they have their windows facing south. The a huts have their windows facing north, no ray of sunshine ever falls into them. In December and January [it] doesn't rise from behind the hills until after 9 a.m., and at 3 p.m. it has once more disappeared. This was the final compound to be built - it was built on rising ground to the south of Camp III split into eight sections though only 7 were used to house internees, the eighth being used as a vegetable garden tended by the internees. The arrangements within this camp were described in great detail by the Camp Central Committee - see reports - it would appear to have been the best run of the four camps. In the final days of the camp compound 4 became a privilege camp housing near 700 transferred from Wakefield when that camp was closed. The first Commandant was Lt Colonel J. M. Carpendale, each camp having a sub-Commandant - Majors A. B. Kaye (Camp1), Fife Scott (camp 2), Quayle Dickson , D.S.O. (Camp3) , and Anderton Nodin (Camp 4). J T Baily noted that "the first Commandant was not there long, he did not adapt himself very well to win the good will of the internees." Public disquiet with the number of escape attempts and especially one in which the escapees appeared to be in possession of a chart and other equipment, was raised in Tynwald by the MHK for Peel T. H. Cormode [Mona's Herald 16 Jan 1916] and a resolution calling for a public inquiry was carried unanimously. On the 17th February 1916 it was announced that Lt. Col Carpendale had resigned and Lt. Col F W Panzera appointed in his stead. The Ramsey Courier of 18 February 1916 commented that it "came as no surprise. A Court of Inquiry was held about a fortnight ago, presided over by officers of distinction, who came for the purpose. The recent incidents at the Camp - especially the tunnel and the escape of four aliens - were such that Tynwald Court demanded a public inquiry. This could not be granted by the war office for obvious reasons". The next Commandant was Lt Col Panzera who was promoted to Colonel but died very suddenly from heart failure while making a tour of the Camp in company with Brigadier-General DA. Thomas on 4th June 1917 [IoM Examiner 9 June 1917], the report described him as "extremely popular at the Camp, the military and civil staffs and the interned aliens holding him in high respect. He was a firm but just officer", the report continuing with a brief biography and description of the removal of the body for burial at Dovercourt Essex. Baily had a much higher regard for Panzera describing him as "a man of wide experience, high attainments, lofty principles and a true Christian gentleman, a devoted member of the Anglican Church" and continues "He immediately set his talents and sympathies to work for the best interests of the internees and it was not long before he had not only won their respect but in many cases their loving regard". He was replaced by Lt Colonel B. Metcalfe-Smith, C.B.E., who had been Assistant Commandant at a Prisoner of War Camp in England. According to Sargeaunt "He introduced many changes for the better at Knockaloe, and was in command of the Camp at its most difficult period" - this period saw an attempted mutiny and significant problems with the significant reduction in the diet caused by the general severe shortage of food caused by U-boat activity. Baily comments that "he took matters very easily, was not concerned about much but as our work was by this time well established and essential to the Camp's welfare and as signs were showing that the end of the war was nearing it did not matter much though I was sorry at the lack of sympathetic interest". The Work of clearing Knockaloe Alien Camp is proceeding steadily and it is probable that all the aliens there will have been removed in about three months. Already Camp 2 is completely cleared and several compounds in Camp 1 have also been cleared. During the week about 1000 aliens have been repatriated, parties leaving each day. The report was somewhat optimistic - the final internees were not discharged until October 1919 - these prisoners were mostly those who were appealing against forced re-patriation to a Germany many had not seen since childhood. Little positive can be said about these arrangements which saw the suicide of at least one internee. J T Baily, in his talk given on his visit to Germany in 1920 recounts that day in mid Octorber walking down to the main gate at 6am and seeing the last lot of men, about 157, march off towards Peel. Today the only existing building of the camp is an anthracite store on which is mounted the plaque erected by the Anglo German Family History Society and of the huts, only the concrete supports raising the huts above the 'swamp' remain, formed into a wall along the farm road. B.E. Sargeaunt The Isle of Man & the Great War Douglas: Brown & Sons 1920 chapter 3 is a semi-official history of the administration of the camps by the, at that time, Government Secretary and Treasurer. (I'm afraid it reads a bit like one of those official reports - concentrates very much on the administration rather than the internees). Chapter VI of St. Stephen's House paints a more bleak picture of Internment and Knockaloe Camp. James Baily was the Quaker craftsman who organised much of the basket making etc in the camp. His biography by son Leslie Baily in Craftsman and Quaker London George Allen & Unwin 1959, deals extensively with this aspect. Paul Cohn-Portheim in Time stood still New York E. F Dutton & Co 1932 gives another dismal picture of early days at Knockaloe - he was interned in late May 1915 and after a brief stay at Stratford was sent to Knockaloe before gaining a transfer to Wakefield. P. Stoffa Round the World to Freedom London:Bodley Head 1933 - chapters 12-14 cover his internment at Knockaloe. A visit of Journalists in 1916 is reported in Manx Quarterly.